Most Croft students are also members of the Honors College. The two programs work closely together and have aligned many of their requirements, thus avoiding overlap and unnecessary duplication. For example, many Croft courses earn Honors College credit, while the Croft senior thesis does double duty as the Honors College senior thesis. Joining both Croft and Honors therefore does not mean taking on extra burdens. On the contrary, Croft and Honors perfectly complement each other. Croft students do not have to be members of the Honors College. Croft students already have the most important advantages of the Honors College, such as smaller classes, individualized attention from faculty and advisers, a closely knit community of students, and special facilities, including dedicated computer labs and study spaces. Membership in the Honors College adds to the special advantages of the Croft Institute. 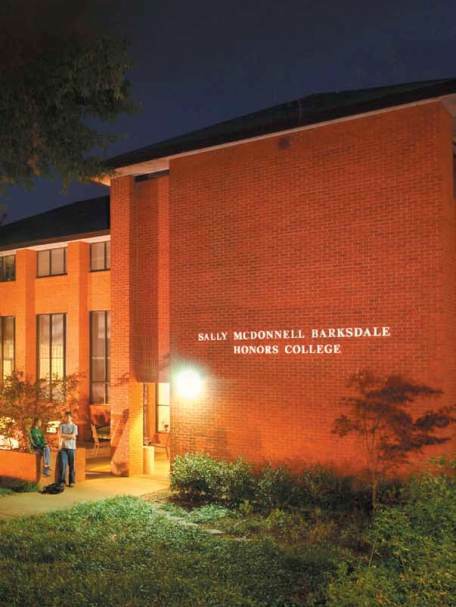 The Honors College provides access to additional opportunities, including scholarships, internships, eligibility for Barksdale Awards, and special faculty and staff resources. More information about the Sally McDonnell Barksdale Honors College can be found on its website.